CCGDM is a flagship joint certificate program designed and delivered by Public Health Foundation of India (PHFI), New Delhi and Dr. Mohan’s Diabetes Education Academy (DMDEA), Chennai. The program was conceptualized in 2012 with the objectives to develop core skills and need based competencies in Primary Care Physicians (PCPs), Obstetricians and Gynecologists (OBGYs) for the practice of GDM management and to establish their networks with existing specialized diabetes care centers for improving patient outcomes. 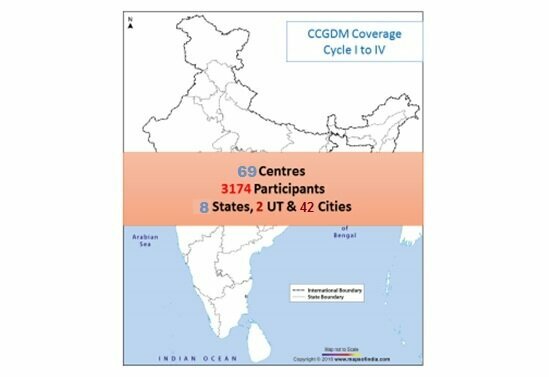 CCGDM Cycle I ( Augaust 2013-November 2013) was a country wide initiative launched on 25th August – November 2013 PAN India and witnessed unwavering support from 15 National Expert, 110 Regional Faculty and 25 Observers since the inception of the program. The initiative which was initially drafted for 1250 primary care physicians saw the participation of 1465 candidates with 43 percent having an MBBS degree and 57 percent having post graduate degrees in myriad fields enrolled across 16 states, 1 Union Territory spread across 39 cities. After the successful completion of the CCGDM cycle I, CCGDM Cycle II (August 2014- November 2014) was launched on 24th August, 2014. It took place in 33 cities across 14 states & 1 Union Territory with 40 regional training centers. There were 80 Regional Faculty & 928 Participants in Cycle II. Cycle III (July 2015- October 2015) was launched on 26th July 2015, spread across 10 states, 1 Union Territory and 17 cities in 20 regional training centers. The course enrolled 364 candidates (48% having post graduate degress and 52% having an MBBS degree) with perpetual support from a panel of 14 National Experts, 40 Regional Faculty and 22 Observers since the inception of the program. Cycle IV (August 2016- November 2016) was launched on 21st August 2016, spread across 11 states, 1 Union Territory and 16 cities in 20 regional training centers. The course enrolled 417 candidates (45% having post graduate degress and 55% having an MBBS degree) with perpetual support from a panel of 15 National Experts, 40 Regional Faculty and 22 Observers since the inception of the program. CCGDM Cycle V (April 2019- July 2019):The programs fifth cycle will be launched on April 2019. In pursuit of excellence in endocrine care and education, South Asian Federation of Endocrine Societies (SAFES) has given accreditation from the year 2014 to 2019 to CCGDM for excellence in providing diabetes education to healthcare professionals. Under the state government initiatives: 250 Medical officers (MOs) have been nominated by 5 state governments to get trained in GDM by PHFI training initiative. The five states nominated MOs under the National Health Mission (NHM) viz. Gujarat 38, Madhya Pradesh 47, Meghalaya 14, Tripura 50 and Uttarakhand 100 Medical officer respectively. Since its inception, the program has received many national and international recognitions, accreditations, awards and accolades.